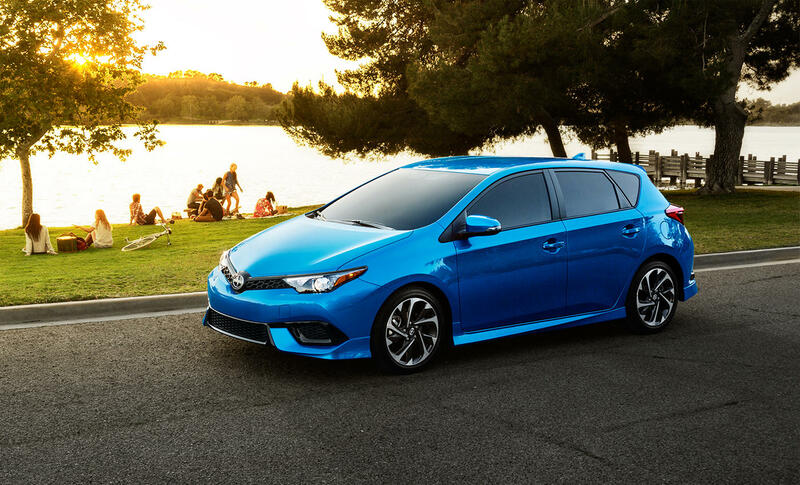 The 2016 Scion iM Review: Scion, Toyota’s youth brand, began life early in the last decade. The huge Japanese company was selling lots of cars, but had concerns that young, first-time buyers were opting for other brands. The answer? Import a few quirky models from Japan under a new brand and change the buying experience. No annoying salesman when you walk in the door. Do your research online. Show you’re cool by driving an inexpensive, offbeat model like the original xB, a rolling statement of independence from tradition. It worked well for a while, but Toyota deprioritized Scion, leaving their hatchbacks alone after a 2008 set of replacements. They did bring in a more conventional coupe, the microscopic iQ, and a couple years ago, debuted a two-seater sports car co-developed with Subaru. But the mainstream Scions were really getting old. Now, the new iM and iA have arrived to save the day, but a little too late, as Toyota has dropped the brand. The iA is a sedan version of the Mazda2, and will be the subject of a separate story, but the iM is, well, a very slightly sportier Toyota Corolla. The design is contemporary, but hardly attention-getting. Based on the European Toyota Auris, it features the sharp-nosed styling of current Toyota models. A blacked-out grille, 17-inch alloy wheels with 225/45R17 tires, and substantial ground effect panels below the doors cry out “sporty” on the otherwise Euro family car body. The interior is pretty much straight Corolla. The upright, blocky dash panel appears to be influenced by BMW, but on a budget, so surfaces are hardly plush, and the design feels conservative, despite an unexpected slice of white trim along the passenger side. The piano black trim is a step above ordinary. The leather-wrapped steering wheel feels good in your hands, and features white stitching, but the shift lever isn’t hide-covered to match. There’s climate control instead of just plain air conditioning, and with an acoustic layer windshield, foam type insulation and floor silencer sheets keep the cabin quiet for a small car. The iM gets a 1.8-liter four-cylinder engine that generates 137 horsepower and 126 lb.-ft. of torque. For young environmental protection enthusiasts, the EPA numbers are good, 28 City, 37 Highway, and 32 Overall. I averaged 25.8 mpg. Green scores are a 5 for Smog and a nice 8 for Greenhouse Gas. My Classic Silver Metallic example came with the 7-speed CVT automatic, which although it’s a continuously-variable transmission, when you use the shift paddles it approximates real gears. There’s a Sport Mode, which alters the “shift” points and tightens up the electronic power steering. The six-speed manual would be a better choice for driver engagement. But still want something special? Scion offers some of the TRD - Toyota Racing Development - performance goodies, such as an air intake system, sway bar, and lowering springs. The iM is not the cheapest Scion, but it’s certainly not expensive, either. Prices start at $18,460 for the manual model and $19,200 for the automatic, plus $795 for shipping. My tester added carpeted floor mats, wheel locks, and a rear bumper protector, bringing the grand total to $20,334. My first new car, a Toyota Tercel, a pre-Scion entry-level subcompact car, came to $4,300 out the door, but no millennial was even born when that purchase took place. $20,000 is an affordable price in today’s economy. There are a few things I’d like to have on my Scion, such as keyless entry and SiriusXM Satellite Radio. And I wish the sun visor slid out when it was on the side so I didn’t get the sun in my eyes. The Bottom Line: Scion has always sold cars as “monospec,” which means you choose a model, color and transmission and take delivery. Where the fun begins is when you start choosing from the wide range of dealer-installed accessories. Much as you buy the same iPhone as everyone else but put it in a custom case, or have your special coffee combination at Starbucks, now with the new 2016 Scion iM you can add navigation, install body graphics, upgrade the cargo area, bright up the interior lighting, install all-weather floor mats, and add much more.